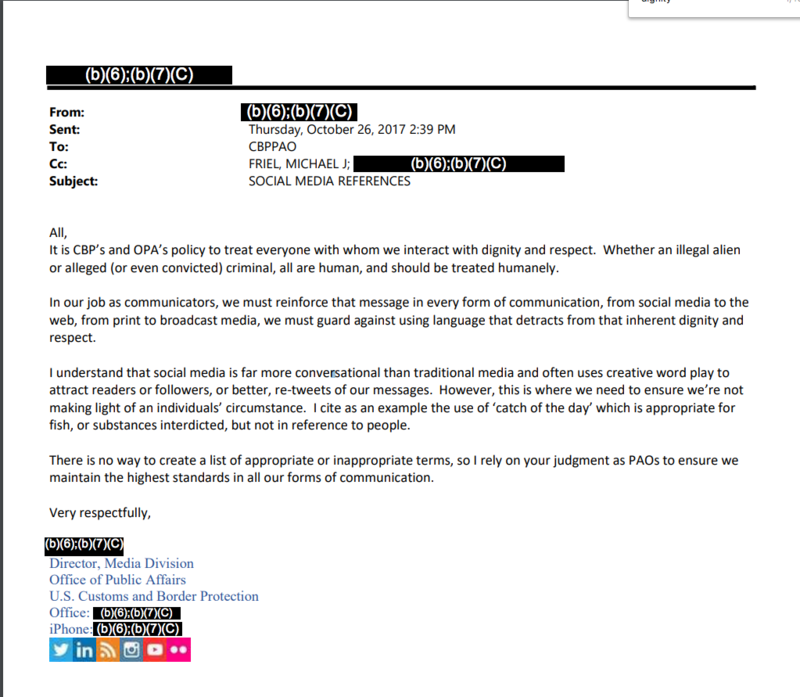 The director of CBP’s media division at the time, whose name has been redacted, said everyone the agency interacts with should be treated with dignity and respect. CBP did not respond to a request to identify who the director was at the time, but Wayback Machine, a digital archive of the internet, shows that Daniel Hetlage was listed as director of CBP’s media division between September 2017 and January 2018. Carlos Diaz is currently acting director of media for CBP. “We can’t say for certain [the email] was prompted by our FOIA, but the timing is suggestive,” said Clark Pettig, communications director for American Oversight. The message also said that while social media is more conversational and uses creative wordplay to attract people’s attention, it’s an area where CBP spokespeople need to ensure they’re not making light of an individuals’ circumstance. “I cite as an example the use of ‘catch of the day’ which is appropriate for fish, or substances interdicted, but not in reference to people,” said the director of CBP’s media division. One of the tweets that prompted American Oversight to file the FOIA was posted on Oct. 20, 2017, and showed photographs of four men the Border Patrol in the Tucson, Arizona, sector had arrested. All of them had convictions in the US or Mexico. The convictions included murder, two counts of felony sexual conduct with a minor, and misdemeanor charges of sexual assault. Prior to this tweet, CBP had used the hashtag to publicize drug interdictions, seizures, and arrests, American Oversight found, adding that the Oct. 20, 2017, tweet was the only one to include pictures of people. In American Oversight’s Oct. 24, 2017, FOIA request, the group said pairing the hashtag #CatchOfTheDay, invoking the freshest fish being sold or served, with photos of people was dehumanizing. In June the watchdog group filed a lawsuit because it had not received any of the records it asked for. “The biased, propagandizing nature of combining the hashtag with pictures of detained persons is particularly disturbing in light of recent records,” the watchdog group said. American Oversight was referencing the records from Immigration and Customs Enforcement and DHS that included instructions to immigration officials across the country to try to portray undocumented immigrants caught in raids as criminals.